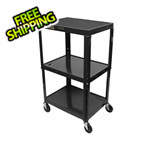 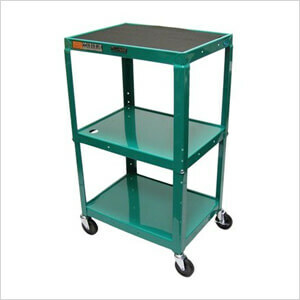 This 42" Height Adjustable A/V Cart with 3 Outlets (Green) is the ultimate multi-tiered steel mobile cart for your classroom/office. This A/V Cart comes with four 4" caster wheels, giving you the base you need for projectors, small televisions, stereos, and more. 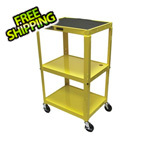 This model includes a 3-Outlet electrical unit that gives you the all-important mobile power and ample space while on the go (the cart includes a 15' cord and cord winder).